Dorothy Lee Rosenbalm Vaughn, age 93, of Pleasant Hill completed her earthly journey on Monday, January 14, 2019 returning to her Lord from her home, surrounded by family. Dorothy was born June 25, 1925 in Pleasant Hill to Myrtle Lucille Foote Rosenbalm and Robert Harvey Rosenbalm. As a youth Dorothy excelled in both track and basketball. She twice represented Pleasant Hill in the All Cass County Track Day winning the blue ribbon one year and the second place red ribbon the next year. She was a 3 year letter winner and captain of her high school basketball team, graduating in 1943. Dorothy continued playing basketball for the Pleasant Hill town team “The Jolly Green Giants” until she was 48 years old. On August 14, 1943 she was united in marriage to Harold Edwin Vaughn, also of Pleasant Hill. They spent their entire married life in the Pleasant Hill community. Harold and Dorothy raised 4 children. David Edwin Vaughn of the home, Sharon Lee Clark (Bill) of Versailles, Mo, Harold Dean Vaughn (Chris) of Marshalltown, Iowa and Robert Layne Vaughn (Teri) also of Pleasant Hill. In 1960 Dorothy went to work outside the home. She worked at O’Hotta’s Ben Franklin store “for Christmas money”, became a friendly face at Charlie’s Dairy Cup during its heyday of the 1960s and was elected for 2 terms as property tax collector for the City of Pleasant Hill. She retired in 1988 after working 12 years for the Pleasant Hill School District. 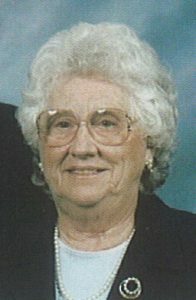 Dorothy was member of the American Business Women Association, BPW, the Pleasant Hill Lioness Club, First Baptist Church and past treasurer of the Pleasant Hill Historical Society. She was a volunteer at the Pleasant Hill Health Care Center and served as chairperson of the VFW Poppy Sales effort for many years. Dorothy was a charter member of VFW Auxiliary 3118 and in 1972 was instrumental in the founding of the CASCO Area Workshop for the Handicapped. Dorothy served on its board of directors for 45 years. Dorothy is known to all as a devoted wife, loving mother, grandmother and great grandmother. She was a dedicated care-giver and a wonderful cook. She was a marvelous example of living life the right way for all who knew her. She always gave freely of her time, talents and heart making the best out of what this world gave her, always believing God would show her the way. She spent a lifetime of giving and forgiving. Dorothy was preceded in death by her parents, her husband Harold in 1987, her younger sister Lilyun (Mrs. Charles “Bud” Gray) and her life-long friend, Minnie Mae Crawford McGee. Dorothy is survived by her 4 children, 7 grandchildren Ryan Vaughn (companion Kendra Rathje), Angie Shibe (Tim). Katie Deike (Ben), Aron Vaughn (companion Kathleen McCann), Robbie Vaughn (fiancé Kelly Wilson), Christina Benware (Patrick) and Leeanna Meador (Donald Wayne). She was blessed with 10 great-grandchildren Shalynn Meador, Grayson Benware, Brooks Benware , Brynn Deike, Luke Deike, John Deike, Kamryn Deike, Ava Shibe, Dean Shibe and Jake Shibe. Visitation will be held Friday evening, 5-7 pm, January 25, 2019 at Wallace Funeral Home. A V.F.W. Auxiliary Memorial Service will follow at 7:00 p.m., conducted by V.F.W. Auxiliary Post #3118. Memorial services will be at Wallace Funeral Home on Saturday January 26th at 11:00 a.m. Burial will follow at the Pleasant Hill Cemetery. Casket Bearers will be David Vaughn, Dean Vaughn, Rob Vaughn, Aron Vaughn, Ryan Vaughn, Robbie Vaughn and Danny Vaughn. Honorary Bearers are Bill Clark, Arlin Vaughn, Homer “Sonny” Foote, Darrell Gray, Johnny Albin, Robert Lee Crawford, Dean Bradshaw, Charlie Walker and “All Her Boys”. The family is deeply grateful for the outpouring of love, prayers and support in many heart-felt forms from too many people to name individually in this space, but including Village Hospice, Ann Cotter, Ruthie Redford, Donna Callaghan and Kim “Twyla” Murphy. In lieu of flowers the family suggests donations to the CASCO Area Workshop in Dorothy’s memory. Well done, Dorothy Lee Vaughn, My good and faithful servant. A good daughter, sister, wife, mother, grandmother, great-grandmother and always a friend. Dorothy was a dear loving woman. She was a dear friend to our mother, Mabel Harrald, Always there to lend a hand Her children are a testament to the person she was. Family was important to her more than any of us know. She will be deeply missed in our community. God has one very special Angel now that will watch over her family. The Harrald family extends our deepest condolences to you all. Dear Dean and family, I am so sorry to hear about the passing of your mother, grandmother and friend. She lived a long and productive life. I pray that heartfelt condolences and loving memories that will always be with you bring you some comfort during this painful time. God Bless you. She was one of the strongest women I ever knew and stood as an example for women and for what a man would want, as my uncle did. I will miss her being an active part of our family. So Very Sorry for your loss. I Miss the B & M Cafe days when she and David would come in for breakfast. It was always a pleasure.